A Day Without a Woman? Boston restaurant-goers wouldn’t eat very well. 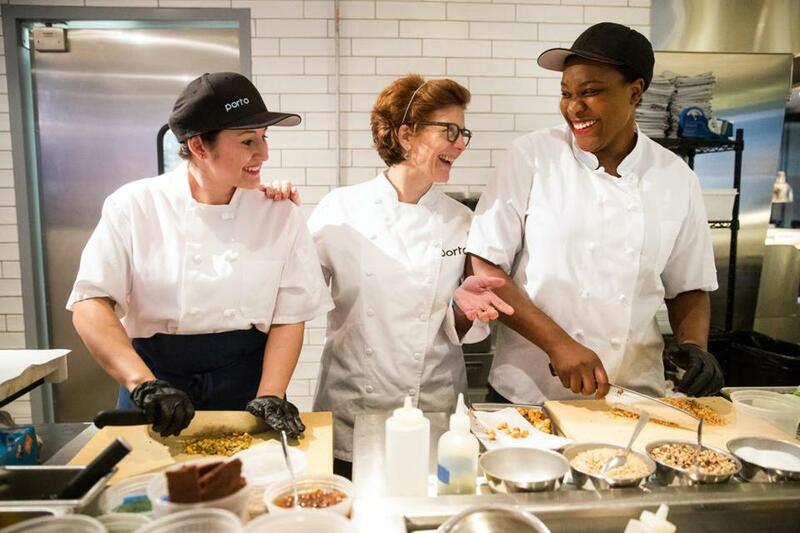 From left to right: line cook Vidalba Garcia, chef Jody Adams, and line cook Candace Blackwell prepared for dinner service at Porto in Boston. The organizers of the women’s march have declared March 8 “A Day Without a Woman,” and they’re calling for a general strike. If Boston’s female chefs failed to show up Wednesday, the city’s food scene would be hard hit. For starters, there would be no No. 9 Park, Menton, or Drink (to name just a few Barbara Lynch spots). No Flour bakeries or Myers + Chang (Joanne Chang). No Oleana, Sarma, or Sofra (Ana Sortun). No Sweet Cheeks or Tiger Mama (Tiffani Faison). No Porto, Saloniki, or Trade (Jody Adams). Scampo? Without Lydia Shire, you can forget that, too. The Boston area is known for being supportive of female chefs, and many of our top restaurants are led by women. But it is an exception in an industry where a macho culture can still sometimes relegate women to the “pastry box” and other background roles, and family-friendly policies like parental leave aren’t always on the table. Where do women stand in the kitchen today? According to 2016 Bureau of Labor statistics, the percentage of chefs or head cooks who are women (21.4 percent) is even lower than the percentage of CEOs (27.3 percent). In a 2014 Bloomberg analysis of 15 prominent US restaurant groups, just 6.3 percent of the head chefs and restaurant owners were women. Of the US restaurants that merit prestigious Michelin stars, not one of 14 three-star restaurants has a female executive chef. Only three out of 25 two-star restaurants are led by women. And women are on top or share the top spot at just 15 of the 130 one-star restaurants. Worldwide, five out of 130 three-star chefs are women. It’s part of a conversation that has been going on for years. In 2014, Adams, a James Beard award winner, convened a panel. Over lunch at Rialto, the restaurant she ran for more than 20 years, a group of about 100 participants (mostly women, many but not all from the hospitality industry) discussed contributing factors — a dearth of women in the pipeline poised to move up to chef; a media landscape that disproportionately covers male chefs; an old-boy network that means men are more frequently asked to be part of panel discussions and other high-profile events; the reluctance of some women to engage in self-promotion. Indeed, even in today’s more equal world, women still bear a heavier load than men in balancing work and family, according to a 2013 Pew Research Center survey. Working long, late hours — and the impossibility of working from home — makes parenting as a chef uniquely hard. None of that should keep women from pursuing the highest levels of success, says Lynch, one of Boston’s best-known chef-owners and mother of a 13-year-old daughter. “They’ll be proud to have a hard-working mother,” she said of chefs’ kids. And strong role models are crucial. Deborah Pine, executive director of the Center for Women and Business at Bentley University, says it’s a lack of confidence — not the “mommy track” — that drives women from both the corporate and restaurant worlds. “They don’t see female role models. They don’t believe they have a supportive manager. They drop out not necessarily because of family issues but workplace issues,” she said. Rather, she sees an institutional problem, beginning with the type of restaurants that are considered for top awards — namely expensive places that require sizable startup funds. The tide is starting to turn, thanks in large part to the efforts of those within the industry. Between 2007 and 2012, women-owned restaurant businesses grew at a rate more than three times faster than that of the overall restaurant industry, according to the US Census Bureau. In 2012, Rohini Dey, a trustee of the James Beard Foundation and a restaurant owner, helped launched the James Beard Foundation’s “Women in Culinary Leadership” program. An internship and mentoring program, it aims to smash the “gastronomic ceiling” and free women from the “pink cage” that relegates them to the world of pastries or cold stations, she said. 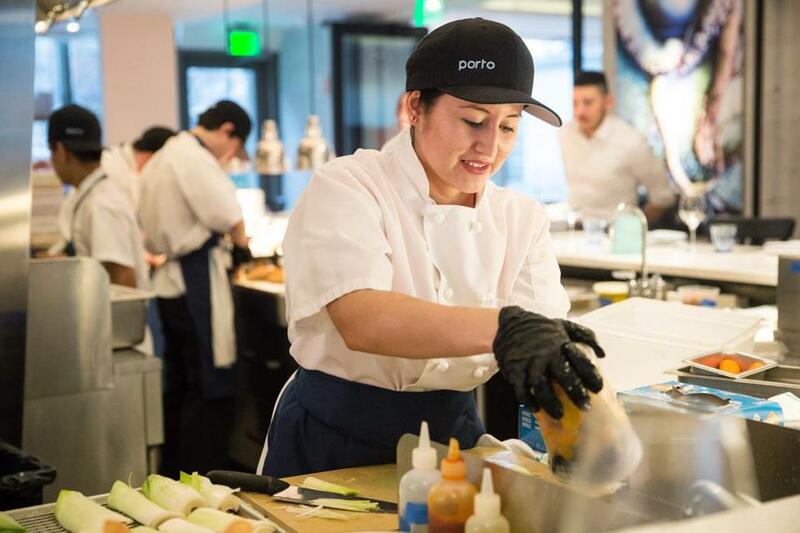 Line cook Vidalba Garcia prepared for dinner service at Porto in Boston. High-profile New York restaurateur Danny Meyer’s Union Square Hospitality Group recently introduced a parental-leave policy, making headlines with the announcement. Starbucks also expanded its parental leave. In Boston, Chang offers paid maternity and paternity leave. She has also modified jobs for returning mothers to give them more flexible positions; for instance, the interim director of operations left and came back as a training manager. And the award systems that often favor male chefs are starting to see pushback. In January, the people behind the influential World’s 50 Best Restaurants list announced their 2017 winner for “The World’s Best Female Chef.” The award has been controversial in years past — aren’t female chefs just, you know, chefs? But this year the response was so swift and scathing that the organization published a blog post both defending the award and anticipating its disappearance (although it doesn’t appear to be going away soon).